iPhone 5 Design: Large Gesture Based Home Button, 3.7-inch Screen, iPod-Like Back? Following the previous rumors about the iPhone 4S/5, it looked like the next-gen iPhone will just be a hardware upgrade over the current iPhone 4 instead of a cosmetic one. But according to ThisIsMyNext, things might be a little different, in fact way too different from what we’ve been hearing about the next gen iPhone all this time! 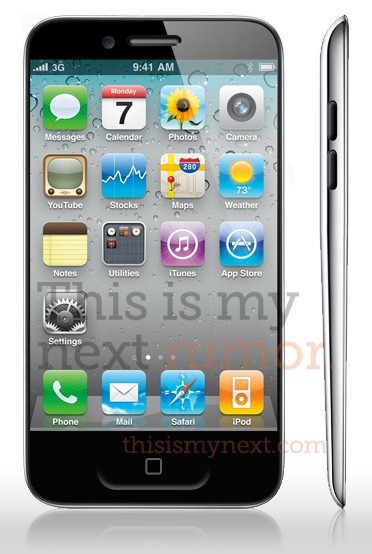 ThisIsMyNext is reporting from their sources that the next gen iPhone looks a lot like the iPod touch 4G. It will boast a completely redesigned exterior with a screen size of 3.7 inches, which is 0.2 inches more than the screen size of the iPhone 4. For starters — as I reported back in January on Engadget — the design of the phone is set to radically change (“a completely redesigned handset”). Our sources say the new model (or at least one of the new designs in testing) looks “more like the iPod touch than the iPhone 4.” The phone will be thinner than the iPhone 4, and may have a “teardrop” shape which goes from thick to thin (something along the lines of the MacBook Air profile). The home button will be more oriented towards gestures, something which Apple has been toying around with for quite some time but haven’t made available to the general consumers like us. The increased screen size doesn’t mean more pixels, it will maintain the same resolution of 960 by 640 as that of the iPhone 4, but at the same time retaining the Retina Display effect. Regardless, the sketch we’ve seen suggests the screen will go up to 3.7-inches while keeping the current resolution, and at that size, pixel density goes from 326 to 312 (a drop of 13ppi). That means that Apple can still tout Retina Display technology (the claim is that anything above 300ppi means the pixels aren’t distinguishable at 12 inches). Now, keep in mind that this info isn’t fact — we’re getting lots of threads from lots of places and trying to make sense of the noise. The versions of devices our sources are seeing could be design prototypes and not production-ready phones. Still, there are strong indications that Apple will surprise a public that’s expecting a bump more along the lines of the 3G to 3GS — and this is some insight into where those designs might be headed. So, what do you think? The next gen iPhone would be a completely overhauled device or just a slight internal hardware upgrade? I would leave this one for time to tell. But we will keep you updated as more news unfolds related to the next gen iPhone, so stay tuned!